The iPod Photo brought us one step closer to the iPhone. October 26, 2004: Apple debuts its iPod Photo, a device capable of putting not just 15,000 songs in your pocket, but also 25,000 photographs. It is the first iPod to offer a color screen and the ability to display digital images and album cover art. The iPod Photo represents a big step forward in the functionality of Apple’s iconic music player. 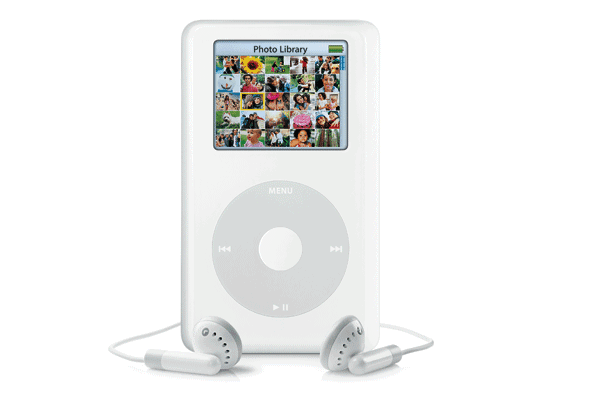 A fourth-generation iPod, the iPod Photo entered the product line at the height of its cultural impact. Nonetheless, the device brought some innovative new features in addition to the 2-inch, 65,536-color LCD with LED backlight. Improvements included increased playtime and the ability to send images to a TV via composite- or S-video cables. Beyond the screen and other updates, it retained the same Click Wheel controller as other iPods, along with then-standard FireWire and USB 2.0 connections. It came in two configurations: a 40GB model that retailed for $500 and a 60GB version that cost $600. This made the iPod Photo a relatively pricy (although tempting) proposition. Of course, the screen was the iPod Photo’s big selling point. It made a big difference when compared to previous iPods’ drab, monochrome screens. Menus looked cleaner and the built-in Solitaire game finally proved playable. Even better, artist names or song and album titles that didn’t fit on the screen no longer got cut short with an ellipsis. Now, they scrolled across the screen. It was like living in the future! Looking back from today’s vantage point, it is obvious that devices like the iPod Photo weren’t simply attempts to prolong the lifespan of a product getting long in the tooth by slapping on a few cheap (or not-so-cheap) gimmicks. Instead, the ability to carry a high-end color display in your pocket, and to be able to use this to view photos, was part of the build-up to the iPhone, which Apple unveiled in 2007. It helped pave the way for Apple’s arrival as a true “mobile first” company. Did you own the iPod Photo? Leave your comments below.